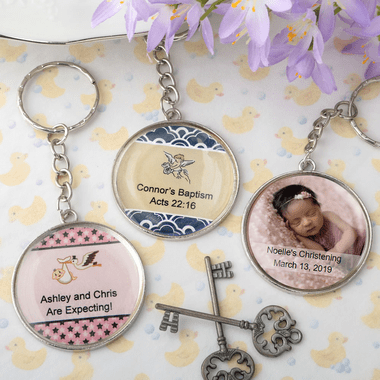 Give a practical, personalized favor with these religious keychains. They are ideal for a baptism, christening, holy communion, confirmation or any other event. You assemble these keychains by taking a label from a sheet and placeing it in the round metal area. Place the expoxy dome on top for a finished look. The dome also provides a clear barrier to protect the sticker.